Southern Utah University’s Department of Music welcomes guest artist, David Rogers, to campus on Saturday, September 22, 2018, at 7:00 p.m. in the Thorley Recital Hall in SUU’s Music Building. Rogers and SUU Music Adjunct Professor Dr. Roland Stearns, will join forces to bring to life music from the Sixteenth and Twenty First Centuries, performing the music of Bach, Dowland, McLaughlin, and Rogers. This concert is free and open to the public. 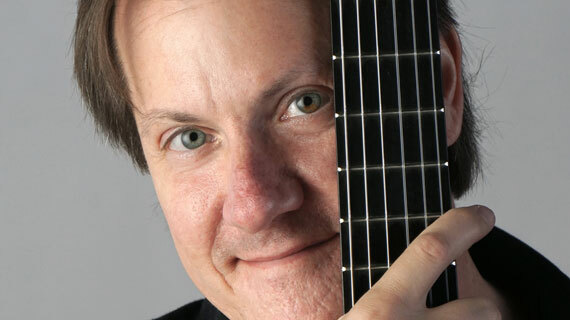 David Rogers is a versatile guitarist who has studied at the Schola Cantorum Basiliensis in Basel Switzerland, Indiana University, Oakland University, and Wayne State University. He was a musician with the Oregon Shakespeare Festival for 18 years and taught at Southern Oregon University for 13 years. His performances have been broadcast nationally and he has been named “a prominent guitarist” by the New York Times. Dr. Lawrence Johnson, Chair of the Department of Music at SUU, says, “To bring in musicians who are performing in the ‘real world’, such as our guest guitarist, David Rogers, is very beneficial to our students. They can see first-hand that professional musicians not only exist but thrive! And to have the opportunity of our expert faculty, namely Dr. Roland Stearns, performing with guest artists, is an even greater bonus for students and community enthusiasts, alike. Concerts of classical guitar duets are quite rare; so, my advice would be to attend this unique concert and enjoy the enriching experience of hearing live classical music by professional musicians!" Dr. Roland Stearns studied in Madrid, Spain and Salzburg, Austria. He has performed nationally and internationally. Stearns headed the University of Alaska-Anchorage’s guitar program prior to his move to Southern Utah. Join us for a special evening of guitar and string music from the Sixteenth and Twenty First Centuries. For more information about the Department of Music at SUU, please visit www.suu.edu/pva/music.